Yes. Until No One Escapes Cidhna Mine is complete. 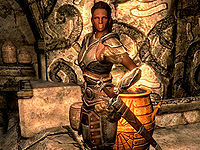 Thonar Silver-Blood is a Nord warrior who lives in The Treasury House in Markarth. Along with his politically involved brother, Thongvor, Thonar runs what is known and feared as the Silver-Blood Family, by far the most influential family in the Reach. But while Thongvor spends all of his time trying to get political influence inside Understone Keep, thinking the roaming civil war is to blame for the repeated Forsworn attacks all over the Reach, Thonar runs an entirely different operation and has done so since the Markarth Incident, an operation unbeknown to both his brother and his snobbish wife, Betrid. During the quests The Forsworn Conspiracy and No One Escapes Cidhna Mine you will uncover the complex scheme of Thonar Silver-Blood and how deeply involved he is with the Forsworn. Thonar is married to Betrid Silver-Blood, a former inhabitant of the Temple of Dibella turned upper-class and snobbish. However, the marriage is on paper only, as the couple has little to say to one another and Betrid openly admits to have married Thonar for his money. 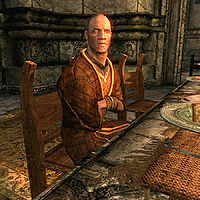 Prior to The Forsworn Conspiracy, Thonar spends all of his time behind locked doors, sitting in his chair, without ever eating or sleeping. He leaves the talk to the desk clerk, Rhiada, and the cleaning to the two servants, Donnel and Nana Ildene, the latter a lifetime servant for the Silver-Bloods. 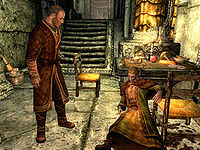 Thonar's routine may change during The Forsworn Conspiracy, or he may remain sitting for the rest of the game, depending on your choices during the quest. See bugs for details. Thonar wears a set of fine clothes and a pair of fine boots, and is equipped with a steel sword. He carries a key to the Treasury House, a belted tunic, and a selection of upper-class loot and gold. Should you manage to get into Thonar's quarters by picking the lock, he will provide some limited information, although a few truths will come out as well: "I'm a busy man. Half this city works for my family, and I have to keep them in line. ", "Thongvor may be the head of the family, but I'm the hands. ", "We control every piece of this city. The people should be calling us kings. ", "If someone joins the Forsworn, we haul him to the mines." and "Every prisoner in the Reach is just another worker for our family." "We'll leave when we're sure there's no Forsworn here." After the conversation, an angry Ainethach will explain what is going on: "Robbery is what it is. The Silver-Bloods are trying to muscle in on my land. Forsworn attack the mines, and suddenly all these sellswords show up to 'help.' They won't let anyone work until I sell it off." He will then explain what the Silver-Blood Family stands for: "A family of thieves. Running their corrupt empire from Markarth. The Silver-Blood family own half the Reach, and they won't stop until they own all of it." On the contrary, mercenary leader Atar will explain: "You haven't heard of the Silver-Blood family? They're the most important people in the Reach. They practically own the city of Markarth. And we're here on their coin." While the events of Karthwasten suggest something shady is going on, things are really bad in Markarth, where the Forsworn pose a constant, but invisible, threat. As soon as you enter the city, you will witness Weylin execute (or attempt to execute) a visitor from out-of-town named Margret, in broad daylight, declaring: "The Reach belongs to the Forsworn! ", before he is taken down by the guards. While everyone will be understandably upset by a Forsworn attack inside the walls, and Eltrys will seek you out and slip a note into your pocket, local butcher Hogni Red-Arm will tell you a bit about Weylin: "Think he worked down at the smelter. Lot of the laborers there are sympathetic to the Forsworn. They promise people they'll kill off all the Nords that rule over the Reach. Nothing but murderers and saboteurs." Head down to the smelter where you will witness overseer Mulush gro-Shugurz work his employees overly hard to meet a certain quota. When asked if he owns the smelter, it turns out Thonar owns it, along with another prolific citizen, Nepos the Nose: "What? No. Thonar Silver-Blood owns it. He owns everything in Markarth. But he hands all the paperwork over to Nepos the Nose to finish. That old man's back is heavy with burden." He may also include Thonar in one of his greetings: "I tell Thonar I can only smelt what Nepos and his miners dig up." "I tell Thonar I can only smelt what Nepos and his miners dig up." "This is a jail, owned by the Silver-Blood family." "We'd be better off without the Silver-Bloods." "Blood and silver, friend. Blood and silver." "Who knows what that family will do for power?" "The Silver-Blood family are to be left alone, am I clear?" Raerek: "Igmund, we need to talk about the Silver-Blood family." Igmund: "What about them? They seem loyal enough." Raerek: "Loyal? Thongvor supports Ulfric and his Stormcloaks! We should imprison the entire family as a precaution." Faleen: "I second that, Igmund. Who knows what that family will do for power? They could be working with the Forsworn, for all we know." Igmund: "Enough! We can't imprison the very people that own the jail we would be throwing them into. The Silver-Blood family are to be left alone, am I clear?" Inside the Treasury House, the opinions about the Silver-Bloods are naturally more neutral. From her desk, young Rhiada will politely brush you off with: "I'm sorry. We're only interested in helping our patrons. ", and will politely explain the 'patrons' of the Treasury House: "For one, the landowners of the Reach. It goes without saying that they rely heavily on us for our silver and support. All the miners, farmers, and laborers in the Reach get their daily wages through us. Nepos the Nose handles that part of our business. He has a way with the workers." When asked about the Silver-Bloods, she will proudly tell you about her employers: "It's an old family. Very well-respected throughout the Reach. The Silver-Bloods run nearly all the lands in this Hold, as well as the local inn. And of course, they own Cidhna Mine, the finest prison and source of silver in Skyrim." Lastly, the helpful clerk will tell you about the two influential brothers: "You want Thonar Silver-Blood. He handles all the family business. If you're here to talk politics, though, you'd want his brother Thongvor. He spends most of his time in Understone Keep." "You're a very pretty young woman, Rhiada." Thonar: "You're a very pretty young woman, Rhiada." Rhiada: "Why, thank you Thonar. I'm flattered." Thonar: "You're married, yes? To that young metal worker?" Rhiada: "Eltrys, yes, just last season we were wed."
Thonar: "He's a lucky man to have such a beautiful young wife." While the two aging servants will provide little information about Thonar, his wife Betrid Silver-Blood sits on her chair halfway to the locked door where Thonar resides. When you get near her, she will start to patronize you: "I'm married to Thonar Silver-Blood. Keep that in mind while you're speaking to me. ", "My husband Thonar handles all our family's business. He's an important man." She will then state what is obvious: "I married Thonar for the money, and I'm not the least bit ashamed to admit it." She will then readily elaborate on the importance of the Silver-Bloods: "My dear vagrant, we're the only family worth knowing in Markarth. We own everything in this city, even the jail. And guess who owns the Silver-Blood Inn? Not that we named it that, the people just insisted." She will also tell you about Thonar himself: "He's the real head of this family. He may not be the eldest, but all the work that keeps us respected is handled by my Thonar." "Who's running the Silver-Bloods? You or your brother?" Betrid: "Where were you last night, Thonar? Busy with work or have you found some other woman who's willing to tolerate your lack of ambition?" Thonar: "I am busy keeping this family in coin and your pretty little head adorned with jewels, so I'll thank you not to question where I go at night, wife." Betrid: "Well maybe if you would finally convince Thongvor to put you in charge of the family, I wouldn't need to question you anymore." Thonar: "I'll take control of the family on my own time, Betrid. Until then, my brother remains in charge and you'll keep your mouth shut." Betrid: "Oh dear, whatever is a girl to do with such fearful brutes about her?" When Weylin attacks Margret at the Markarth market, it attracts the attention of another young smelter worker, Eltrys. His note tells you to go see him in the currently unused Shrine of Talos. Once you enter he will say: "I'm sorry to drag you into Markarth's problems, but after that attack in the market, I'm running out of time." When asked what he is talking about he will reveal that something is very wrong in Markarth: "You want answers? Well so do I. So does everyone in this city. A man goes crazy in the market. Everyone knows he's a Forsworn agent. Guards do nothing. Nothing but clean up the mess." He then continues: "This has been going on for years. And all I've been able to find is murder and blood. I need help. Please. You find out why that woman was attacked, who's behind Weylin and the Forsworn, and I'll pay you for any information you bring me." While it is obvious that there is a problem, Eltrys will tell you about his past, which very much resembles what is going on in Karthwasten: "It all started when I was a boy. My father owned one of the mines. Rare for anyone who isn't a Nord. He was killed. Guards said it was just a madman, but everyone knew the murderer was a member of the Forsworn. I've been trying to find out why ever since." He will also provide a bit of useful background information on the Forsworn and the Markarth Incident: "They're remnants of the old rulers of Markarth. Natives of the Reach. Followers of the old ways. The Nords drove them out of the city. Ulfric Stormcloak and his men. That was about 20 years ago. But somehow they're still here, and they're killing people." "You want answers? Well so do I. So does everyone in this city." "Everyone knows he's a Forsworn agent. Guards do nothing." "Thonar Silver-Blood was behind that attack in the market." "You. I've seen you snooping around. Asking questions." Margret's trail leads you to the Silver-Blood Inn where the barkeep, Kleppr, jokingly welcomes you: "This is the Silver-Blood Inn. I'll let you figure out who owns it by yourself." At this point, the next part of the investigation depends on whether you saved Margret or not. If you did not save her, the room she rented will contain a revealing journal. If she survived she will sit next to the fireplace and will, with a bit of persuasion, tell you: "I'm one of General Tullius's agents. I was sent to investigate the Treasury House and the Silver-Blood family. They own Cidhna Mine, one of the toughest jails in Skyrim. I was hoping I could buy or steal the deed, but I don't think that's how things work here. Mark my words. Thonar Silver-Blood was behind that attack in the market. Somehow." Once you exit the Silver-Blood Inn, a Markarth City Guard will seek you out and ask you to keep your nose to yourself, hinting that someone made a deal with the guards as well. Weylin's trail will lead you to the slums of Markarth, The Warrens, a place for the lower-class and diseased citizens. At the smelter outside, Omluag will tell you about Weylin: "The Forsworn? That's right. I'll say it. We all knew. Even that fat-headed, slave-driving Mulush knew. Just ask him about it. Bah. Another honest man lost in all this madness. And for what?" Following this advice, smelter overseer Mulush gro-Shugurz will provide part of the explanation about why Weylin went crazy: "I did notice something odd last time we handed out the pay. Little extra slip of paper for Weylin. Took it right to his room after he got it." Inside Weylin's room, you will find the slip of paper, another clue on how the scheme works: "You've been chosen to strike fear in the heart of the Nords. Go to the market tomorrow. You will know what to do." The note is signed by 'N', and when you leave the Warrens, you will be passed up by a big Breton named Dryston, inviting you to a brawl to scare you off the case. After a thorough beating, Dryston will reveal that his employer is Nepos the Nose, another wealthy citizen and the one in charge of Thonar's silver operation inside Cidhna Mine. When you hand in the information about Nepos, Eltrys will say: "Nepos the Nose? He's been in Markarth forever. And he's well-respected among the natives of the Reach." Just like Thonar, Nepos the Nose lives in seclusion inside his house, surrounded by servants. When you reach him, you will find a tired old man in a chair, seemingly ready to tell the truth: "Ah, yes. You've proven to be a real bloodhound. Well, you've sniffed me out. I've been playing this game for almost 20 years. Sending the young to their deaths. All in the name of the Forsworn. And I'm tired. So tired." It is obvious that Nepos is a Forsworn, although he gets his orders from someone else: "My king. Madanach. When the uprising fell at the hands of the Nords, they threw him in the mines. I don't know how, but he lives. I get his messages, and I hand out his orders without question." He then proceeds to tell you about Madanach: "He is the King in Rags. A man who once held all the Reach within his grip. He stokes the passions of the downtrodden in this city. Directs them to kill the enemies of the Forsworn in our name. All from inside Cidhna Mine. A Nord prison. The irony is quite thick." After the conversation, you will learn just how infested Markarth is, as all the servants will draw weapons, showing their true colors, although the question remains; who controls who? When you return to Eltrys with your discoveries from Margret, he will comment: "So the clues point to the Treasury House, then. That makes sense. Thonar is involved in every facet of the city. At this point, it is time to confront Thonar himself and get some answers." Already at the entrance, things have changed inside the Treasury House and Rhiada will be less polite, almost hateful: "The Treasury House is really just for patrons of the Silver-Blood family. You don't belong here." and "I'm sorry. We're only interested in helping our patrons." When you ask to see Thonar she will respond: "I'm afraid he's asked to not be disturbed. He has important business." When you finally gain entrance, you will find Thonar in his chair, doing nothing. When he sees you he will ask: "What are you doing here? I told them no visitors." At this point, Thonar is ready to talk, and you can choose between three options. If you choose to ask him about Margret, he will reveal he knew her true identity: "The Imperial agent? That's right. I knew. How many dogs is the Empire going to send after me? This is my business. My city. You Empire lovers should learn to stay out of it. Now get out." When asked about the Forsworn he will state: "They're crazy. Think they rule the Reach. Well guess who really runs things around here? Me. I own the mines. I make the coin pass to the right hands. That answer your damn questions? Now get out." You can also ask him about the threats you received from the city guard: "What did you expect? That no one was going to notice you butting into business that wasn't yours? The guards know who holds the purse strings in this city, and I don't like snoops. Markarth is my city. You have no right looking into my business. Now get out." While he is still hiding the truth, a sudden noise from the main chamber interrupts the conversation. "What? By the gods, Betrid...."
"We had a deal you Forsworn bastards!" Down near the counter, you will find Betrid Silver-Blood dead by the hands of the elderly servants, Nana Ildene and Donnel, both of them Forsworn agents in disguise. Rhiada will do her best to fight them off, while Thonar will rush down to his deceased wife, yelling: "What? By the gods, Betrid...., Betrid. No! We had a deal you Forsworn bastards! ", "Traitors. Traitors all of you!" and finally, the truth: "Why? We had a deal Madanach. A deal!" After the battle, Thonar will sheathe his sword and say: "My wife. They killed her. Damn Madanach. Damn his Forsworn backside." At this point, you can choose between three options. If you tell him you are sorry, he will angrily say: "No you're not. You want to know what the Forsworn really are?" If you tell him he deserved it, he will respond: "Shut up. Only the gods can judge me. You want to know what the Forsworn really are?" If you ask him if he is finally ready to tell the truth, he will finally reveal his relations with the Forsworn and Madanach: "Fine. You want to know what the Forsworn really are? They're my puppets. I have their 'king' rotting in Cidhna Mine. He was supposed to keep them under control." He will then spill the entire scheme he started during the Markarth Incident over twenty years ago, starting with an explanation of the 'king': "Madanach. The King in Rags. While we were off fighting the Elves in the Great War, Madanach was busy ruling over the Reach. Until Ulfric came and put them down." He will then elaborate: "When their uprising was crushed, I had Madanach brought to me. He was a wild animal, but a useful one. I offered him a stay from execution if he used his influence to deal with any annoyances that came up. Competitors, agents, idiots. So I've let him run his little Forsworn rebellion from inside Cidhna Mine. Now he's out of control." He will also tell you a bit about Cidhna Mine: "My prison. The source of half the silver in Skyrim. The most secure prison in Tamriel. No one escapes. I thought keeping Madanach down there would keep him under control." While it is obvious that Madanach betrayed him, Thonar does not want your help: "You already got what you wanted, you damn hound. This is your fault. You and Madanach are animals, and I'll see you both rot to death in Cidhna Mine for this. Now get out of my house!" He will then stay in the Treasury House, saying nothing to you but: "Get out of my house. Now." However, Thonar is far from finished with making schemes. When you return to the Shrine of Talos to tell Eltrys the news, you will find him dead by the hands of the city guard. As you approach the scene, a guard will rush up to you and say: "We warned you, but you just had to go and cause trouble. Now we have to pin all these recent murders on you. Silence witnesses. Work. Work. Work." Three options are available. When asked why they killed Eltrys, the guard will respond: "We had a nice little deal going between Thonar and Madanach until you and Eltrys started snooping around. Well, you wanted to find the man responsible for those killings? You'll have plenty of time with the King in Rags when you're in Cidhna mine." If you tell them they are corrupt and paid by Thonar, the response will be: "We have a nice arrangement in this city, and we're not letting you get in the way. You have a problem wth that? Take it up with Madanach. I'm sure the King in Rags and his Forsworn would love to meet you. Now you're coming with us. It's a life sentence in Cidhna Mine for you." The last thing you will hear is: "You'll never see the sun again, you hear me? No one escapes Cidhna Mine. No one." 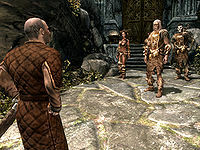 You will find yourself a prisoner in Cidhna Mine, the very source of the silver trade of the Silver-Blood Family and the place where Thonar put Forsworn leader Madanach during the Markarth Incident, thinking he could control him. While it is obvious that Thonar sent his orders to Madanach who passed them on to Nepos the Nose, it is even more obvious that Thonar provided strength to the Forsworn by sending innocent people down there to mine his precious silver. The other prisoners will typically greet you with: "You mess with the Silver-Blood family, you end up here. ", while Odvan is a prime example of Thonar's mistake: "Guards say I murdered someone. I was just sleeping off some mead in my aunt's house, but that didn't stop them from arresting me. I don't even know who they said I killed." He will conclude with: "I wasn't a Forsworn when I came, but I joined up when I got in. Easier that way." 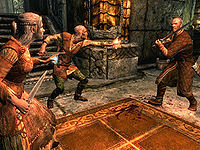 Thonar's methods of framing innocents also proves to create more Forsworn, as evident by Uraccen's story: "A Nord nobleman I served was stabbed in the night. Wasn't me, but I knew I'd be blamed. So I ran. Joined the Forsworn. Started killing. Got caught. Now I'm here." The last piece of evidence is provided by Duach who was a Forsworn to begin with, but was spared because of the silver: "I'm a Forsworn. One of our raids went bad, and I got captured. Would've been fine dying for the Reach with my kinsmen, but the Silver-Bloods want their ore mined, so they threw me in here." "But my execution never came. Thonar Silver-Blood stopped it." "I don't even know who they said I killed." "I wasn't a Forsworn when I came, but I joined up when I got in." "Wasn't me, but I knew I'd be blamed. So I ran. Joined the Forsworn." When you finally reach Madanach, he will sit at his desk with a quill and paper, writing down orders to his allies on the outside. He will ask you: "So, my fellow beast, what do you want? Answers about the Forsworn? Revenge for trying to have you killed?" He will then provide in-depth info on the Forsworn, proving the rebellion is indeed very much alive. He will also tell you to go see Braig, as proof of how widespread the injustice of Markarth is. Braig will also put Thonar's greed into perspective: "I had a daughter, once. She'd be 23 this year. Married to some hot-headed silver worker or maybe on her own learning the herb trade. The Nords didn't care who was and who wasn't involved in the Forsworn Uprising. I had spoken to Madanach once, that was enough. But my little Aethra didn't want to see her papa leave her. She pleaded to the Jarl to take her instead. And after they made me watch as her head rolled off the block, they threw me in here anyway, to dig up their silver." 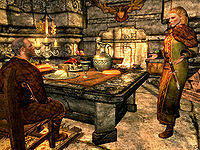 When you return to Madanach, you can ask him about Thonar Silver-Blood and the truth will be revealed: "I had Markarth. My men and I drove the Nords out. We had won, or so we thought. Retribution was swift. I was captured, quickly tried, and sentenced to death. But my execution never came. Thonar Silver-Blood stopped it. He wanted the Forsworn at his call, that I would point their rage at his enemies and spare his allies. And I have. Humiliating at first, but I knew he would let his guard down eventually. That he would come to trust I was under control." With these words, the entire conspiracy has been exposed. While Thonar handed orders to Madanach to prevent his silver trade from being interfered with, Madanach himself was gathering an army on behalf of Thonar, playing the role of his ally. Although imprisoned, the army is now huge enough to break out of Cidhna Mine, and Madanach will willingly ask you to participate. Your choice will lead to the death of Thonar Silver-Blood, or the death of Madanach. "You'll pay for what you've done to my family!" Thonar: "Madanach! Think you can escape my prison do you? You'll pay for what you've done to my family!" Madanach: "Your family? You've poisoned the Reach with your tainted silver for long enough, Thonar!" 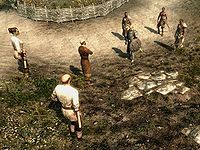 With these words, Thonar will draw weapons, but so will the army of Forsworn who will hack and slash Thonar to pieces where he stands, and continue their wild rage through the city of Markarth, and halfway through the Reach, until they settle down inside Druadach Redoubt, finally free and ready for a new uprising. If you choose to kill Madanach, you will have to make your way through Markarth Ruins on your own, but will be met by Thonar. He will seek you out, and be very grateful. "My eyes inside Cidhna Mine tell me that Madanach is dead. You've done a great service to the Silver-Blood family. 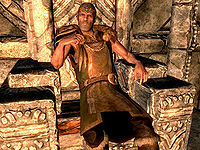 I've had the Jarl officially pardon you, and taken care of a few other loose ends." Two options are available. When confronted with the fact that he had his guards throw you in jail, he will apologize for his strategy: "And you've proven that was the best move I could have made. Don't give me that look. You're free to go. Here, how about a little token for your efforts? My family's ring and all the things the guards confiscated from you when you were jailed. Now if you'll excuse me, I have to figure out how we're going to fill our recently emptied mine." If you instead ask him if you are free to leave, the answer will be: "Yes, you're innocent. As innocent as anyone can be in this city. I guess we also owe you something for locking you up. Here, my family's ring. And everything the guards confiscated from you. Now if you'll excuse me, I have a mine that needs new workers to fill it." He will then hand you the family ring, then return to his life inside the Treasury House, now without a wife or any servants. If you meet a guard on the street, they may comment: "Your name's been cleared... by Thonar Silver-Blood. Consider yourself lucky." There are several ways to keep the inhabitants of the Treasury House alive. You can pickpocket Thonar's Journal and read it, which will cause a quest update, and prevent Nana Ildene and Donnel from attacking. This method will also save Nepos the Nose, as you can skip him entirely. Another method is to head directly back to Eltrys after questioning Nepos. The guards will then be waiting for you, as if you have questioned Thonar. In the game files, Thonar has a secret relationship with Lisbet. 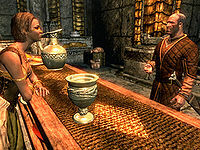 A line of Thonar's dialogue remains unused, as it will only trigger inside the Silver-Blood Inn, where Thonar never sets foot: "My family owns this inn, but I've put Kleppr in charge. Right rat for the right job, I say." During The Forsworn Conspiracy, Thonar will remain seated in his chair. If you choose to question him, thus causing the death of Betrid (along with Ildene and Donnel), his regular schedule will trigger, causing him to wander around, cook, and speak to Rhiada. He will also sleep between 10pm and 6am. However, if you choose to pickpocket his journal and use that as evidence, he will remain seated in his chair eternally, as Betrid will never die. Ironically, the pickpocket method is the only way to trigger Betrid's schedule. This page was last modified on 18 March 2015, at 15:49.